Wigan Athletic have signed Leeds defender Jason Pearce and Inverness Caledonian Thistle striker Billy Mckay. Both have agreed "long-term" contracts with the Championship strugglers and have joined for undisclosed fees. 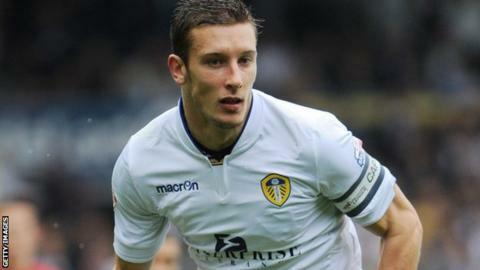 Pearce, 27, and Northern Ireland international Mckay, 26, could feature against Ipswich on Saturday. The pair follow Liam Ridgewell and Chris Herd to Wigan, following their loan moves to the DW Stadium earlier this month. "He's someone we've been tracking for a while, a really powerful centre half, a leader and a warrior on the pitch," said manager Malky Mackay of former Portsmouth and Bournemouth centre-back Pearce. "When we found out he might be available, we immediately did all we could to get him because he's a player who can play a major role in taking the club forwards." On Mckay, the Wigan boss added: "We've been looking at Billy for some time. He lives to score and his record over the past two seasons speaks for itself. He's scored a lot of goals and been deadly for Inverness." Shaun Maloney, Ben Watson, Adam Forshaw, Callum McManaman and Ivan Ramis have all departed Wigan in the past week and ex-Cardiff manager Mackay said he knew he would have to offload players in January. "I knew when I took the job on there had to be a restructure of the squad in terms of it being leaner and also dealing with the contract situation," added Mackay. "So that then really comes to pass when the January window opens up. "It was a process that was going to start in January and we are in the middle of it. "What we are trying to do is make the best decisions for the club and every individual situation - depending on the club that comes in, the finances they want to pay, where the players contract is and where the players head is." Mackay also revealed there could be more departures from the DW Stadium before the January window closes.